Christ is both the fulfillment of the Law (the goal and destination of the Law) and also the end of the Law. We are no longer judged on the basis of law-keeping. True, the standard used for us is the righteousness of God, but this is a standard that Jesus meets in us and for us by being the sin offering for us and sending the Spirit to empower us. This means that God can declare us righteous while at the same time transforming us to strive toward being righteous in the way we live. 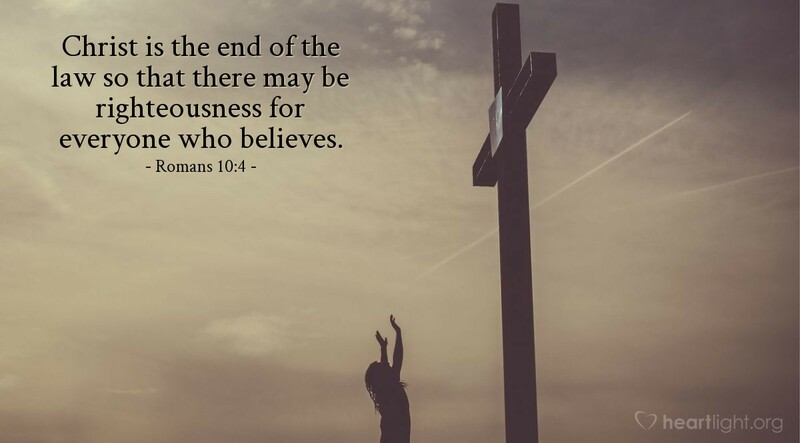 The Law's goal is fulfilled and finds its completion in Christ as his salvation transforms us. Dear Father, I do believe that Jesus is your dear Son, sent to be my Savior, crucified for my sins, and raised from the dead for my victory. I trust my salvation to him and thank you for your incredible gift of grace. In the name of Jesus Christ my Lord. Amen.